The duration of a flash discharge defines the ability of the flash system to capture or ‘freeze’ a moving subject. f you are planning on shooting water splashes* one of your primary concerns is flash duration. Usually when shooting high speed, you set your camera to bulb and shoot in complete darkness. When you want to take the photo, you pop the strobe. This makes the flash duration (actual time the flash emits light) act similarly to shutter speed – the longer the flash duration is, the more motion blur you’d get. When measuring the length of a flash pulse, the duo of t.5 and t.1 times are the industry standard metrics. Understanding those numbers , and the difference between them , can help you make better purchasing decisions on your lighting gear. The first thing you should know is that the numbers are not the same thing and are not interchangeable. If one manufacturer is giving you a t.5 number and the other a t.1, you should not compare them as equals. At the t.5 time, the flash pulse has dropped down to 50% of its peak. At t.1, the flash has dropped 90% from its peak. Essentially, they are giving you a feel for the shape of the back slope of the pulse. So of course, flash manufacturers would prefer you think in terms of the t.5 measurement. But the t.1 measurement is much more of a “all-in” number, even though it is not perfect either. Take a look a this graphical representation of a typical flash pulse which is from a good explanation of t.5 and t.1 times. 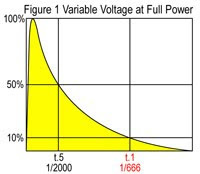 The graph shown here is that of a variable voltage controlled flash, at full power. The vertical axis represents energy intensity and the horizontal axis represents time. You can see that the flash pulse rises very quickly and it decays more slowly, over time. This is typical. Second, the t.5 (1/2000 sec) time is way less than half of the amount of time needed for t.1 (1/666 sec). This is because of the slower decay on the back side of the pulse. If you are an action shooter, you’ll want as short a t.1 time as possible, at the power level you will most likely be shooting at. Short pulse time = action-stopping power. You should try to study those numbers on your flashes and understand what you are getting, depending on how you will use it. And fortunately, the numbers usually get better the further you walk down the power scale. So this is more of a problem for you watt-second hogs who like to hang out at full output while shooting action photos. Make sure you understand the t.1/t.5 numbers that are being thrown around, and how they relate to you. And don’t be snowed by a deceptively pretty t.5, either ,it is the t.1 that counts.